Lose That Girl: RATE IT! New Twist to "On the Rocks"
The marketplace is chock a block full of novelty ice cube makers but only *this* set truly ROCKS. 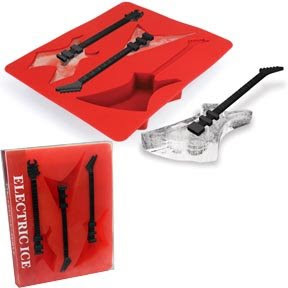 Mini guitar stir sticks sit amidst this ice tray creating 'electric ice' guitars for your cocktail pleasure. Next time company comes calling, you can truly offer refreshments 'on the rocks'! Very cool...I want a drink with a guitar ice cube thingy RIGHT NOW! That is so cool! I want one! !